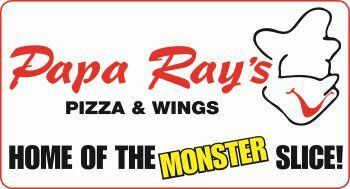 To make every aspect of the Papa Ray's experience amazing. Whether it is the customer service, consistency, or quality, we will strive day in and day out to please our customers. The Greek Pizza is great! Got it delivered and it arrived within 30 minutes. Would definitely recommend this place to anyone. Very friendly and talkative staff. Great service and nice atmosphere. We ordered the garlic parm, mild and teriyaki wings. All delicious. Garlic parm was our favorite. Not dry at all. Love how they redecorated the place. I've had the garlic bread, pizza, rib tips and wings. All were very good. Another thing I liked is that the staff is very friendly!